Car dealer R.C. Kane thought he was about to close a sale, and perhaps was leaning back with an air of satisfaction when the would-be buyer, Mrs. R.N. Upton, became startled at an intersection as another car approached. She went for the brake, but hit the gas, and the car careened into Judge F.W. Houser’s yard and smacked into a concrete post. Kane and Upton, in the front seats, both went through the windshield and were severely cut and lacerated. In the back, Kane’s wife went out the window, and like Dwight Lesley was cut and bruised. The car was wrecked: NO SALE! The victims were sent to Alhambra Hospital for treatment—all save Mrs. Upton, who insisted on seeing a Christian Science practitioner. 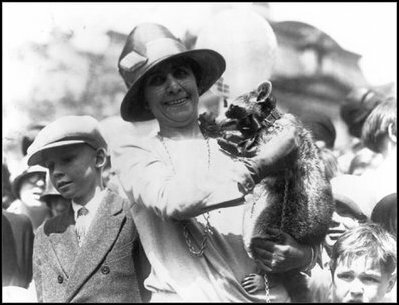 Meanwhile, in Washington, D.C., President and Mrs. Coolidge’s pet raccoon Rebecca, a beloved pardon case from the White House larder one Thanksgiving, escaped and led staff on a two hour spree around the trees of the temporary White House, before climbing down and nonchalantly returning to her stump behind the residence. For more about the Coolidge’s interesting pets, see this article, with much on Rebecca towards the end.